Jess Brown: "Treatment needed to be aggressive and to happen quickly"
Jess Brown, 26, was diagnosed with stage 1c ovarian cancer last year and is currently navigating surgical menopause. Jess feels lucky her ovarian cancer was diagnosed early and is currently organising a Walk In Her Name to raise money for ovarian cancer research this March. "Over two years ago, during my 12-week pregnancy scan, two small cysts were spotted on my ovaries. I was assured that this was quite common and went on to have a wonderful pregnancy and a beautiful baby girl called Bobbie in June the following year. We then thought no more about it until a few months later, when I was admitted to A&E with cramping pain. It soon transpired that I had an enormous cyst on my ovary, which needed to be surgically removed. I recovered well and enjoyed maternity leave with our gorgeous daughter, whilst having regular scans to check for further cysts. After a year of watching and waiting, I had the same routine surgery in November 2018 to remove another large cyst and was warned this may continue to happen and that we should plan to grow our family sooner rather than later. Before we could really do anything about that, we were invited to the oncology clinic. We were given the devastating news that the recent cyst was cancerous and I was diagnosed with a stage 1c mucinous tumour, a rare form of ovarian cancer. We tried our best to enjoy Christmas before I began scans, tests and more appointments. We were told in January that thankfully the cancer seemed to be confined to my ovaries but due to its rare nature there was very little research comparing treatment and outcomes, especially for 26-year-old women, which meant that treatment needed to be aggressive and to happen quickly. Exactly two months after our first trip to the oncology clinic, I had a full hysterectomy which, although difficult, has without a doubt saved my life. Just eight days after surgery we were given the news that there were no signs of cancer outside of the ovary but also no guarantees that some cells could have escaped. For that reason I am having six cycles of chemotherapy over 18 weeks and then will hopefully step down to regular scans and monitoring. "Sharing our story is about raising awareness of how quickly this can happen, but also of how much research is needed for all types of ovarian cancer." Early menopause was not what I had planned for 2019 (and I’m sure not what my family and friends had wished for either) but I have started hormone replacement therapy (HRT) and so far, apart from being constantly a bit warm, I’m doing okay. Our little family will remain little now and our plans for 2019 are very different, but we are together. We are happy. We are still laughing and we are full of love. I am only part way through my cancer journey and so much has been taken from me but I feel so very lucky to focus on the positives. I have a wonderful partner and little girl that is full of sunshine and makes us laugh every single day. We have a supportive and loving family that have dropped everything and continue to support us. I am surrounded by the most unbelievable and strong group of women that I have called friends for 20 years and will continue to cherish. Sharing our story is about raising awareness of how quickly this can happen, but also of how much research is needed for all types of ovarian cancer. Ovarian cancer is very common and can be quite hidden. I was lucky that my symptoms showed through other avenues and that I was already being monitored, but not everyone finds themselves in that position. Through fundraising we can support research that can give oncologists a reliable reference to make decisions about treatment and give patients more options. Join me in raising money to support Ovarian Cancer Action and fund vital research. Let’s walk towards a world where no woman dies of ovarian cancer!" 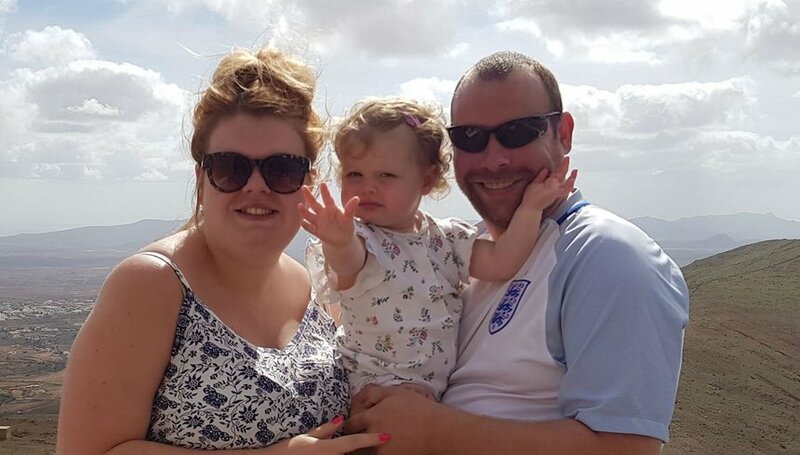 Louise Mitchell: "Cancer has taken a lot from me, but it’s left me with a totally new perspective on life"
Louise was diagnosed with ovarian cancer after a pregnancy scan detected a mass on one of her ovaries. Now two years on from her diagnosis, she has thrown herself back into fitness and is determined to find the positives in her experience. Join us in 2019 to Walk In Her Name. Together, we can walk towards a world where no woman dies of ovarian cancer.